Today's post is one that walks you (readers of AICL) through my evaluation process (what I do) when I pick up a book that is put forth as a Native "legend." The focus of today's post? The Legend of the Beaver's Tail "as told by" Stephanie Shaw, with illustrations by Gijsbert van Frankenhuyzen. It was published in 2015 by Sleeping Bear Press. As the note above the cover indicates, I do not recommend it. See the word "legend" in the title? The word "legend" is often used to describe Native stories. It is one of those catch-all words that should be used in a universal way (applied to all peoples stories) but isn't. Let's pause here. I'd like you to think about all the Bible legends you've read in the children's picture book format. Can't think of one? You're not alone. Most of the stories from the bible are not treated as "legends." If you look up the definition of legend, you'll find the word is used to describe an old story. You're not likely to find "sacred" as part of that definition. Bible stories are old, but they don't get categorized as legends because they're sacred to the people who tell them. Native stories are as sacred to Native people as Christian stories are to Christians. I view the selective use of "legend" as the outcome of a long history of Christians putting Native people forward as "other" to Christianity, with Christianity as THE religion that matters. Those "other" religions aren't religions at all in that Christian point of view. Instead, they're less-than, primitive, superstitious, quaint... You get the point. So--when I see "legend" used to describe a Native story, I wonder if the person telling that story (or retelling it) is aware of the bias that drives that person to use the word "legend." "Vain Beaver is inordinately proud of his silky tail, to the point where he alienates his fellow woodland creatures with his boasting. When it is flattened in an accident (of his own making), he learns to value its new shape and seeks to make amends with his friends. Based on an Ojibwe legend." --Provided by publisher. "Storm Boy follows the rich mythic traditions of the Haida, Tlingit, and other Native peoples of the Pacific Northwest Coast..."
Those are distinct nations with their own stories. If you look at his books, they look like they are Native stories, but are they? If they combine aspects of more than one tribal nation? My answer: No. Let's look just at two that Lewis listed: the Haida and the Tlingit. In the US (in Alaska) there is the Central Council of the Tlingit & Haida Indian Tribes. At their website, you read that they're "two separate and distinct people" and there's also the Yakutat Tlingit Tribe (their direct website is down), also in Alaska. And in Canada, there's the Haida Nation. The difference in the books Lewis does and Shaw's story is that he names several nations and she names one (Ojibwe). Does that make a difference? Maybe... let's keep on with this evaluation process. Who is Stephanie Shaw? Is she Native? With the "as told by" on the cover, do we have a story being told by a tribal member? At her website, I see that she lives in Oregon, but there is no mention of any Native heritage or working with Native populations or attending Native events... Nothing. None of her other books are about Native people. I assume then, that she is not Native. I wonder what prompted her to do this book? As some of you know, I do not insist that a writer be Native in order to write Native stories. As I discussed elsewhere, I prefer Native writers, but I also think that a person who is not Native can write a Native story, and do it well--if they are careful with their research. Wondering about Shaw's research leads to my fourth comment. What does Shaw say about her sources? Have you read Betsy Hearne's article, Cite the Source, Reducing Cultural Chaos in Picture Books, published in School Library Journal in 1993? An excellent article, it was a call for better source notes. It includes a "source note countdown" that can help reviewers evaluate a source note. The worst kind of note is nonexistent. It is #5 in Hearne's countdown. The best kind is #1, "the model source note." So... let's look at the notes in Shaw's book. Legends are an important part of Ojibwe culture. They are stories passed from one generation to the next, usually through oral storytelling. They are sometimes meant just for fun and entertainment. Other times they are used to teach a lesson about behavior. In a legend such as The Legend of the Beaver's Tail, we learn about how pride and boastful behavior can drive friends away. We also learn how sharing among friends can build a community. It starts with that word (legend). I've already said a lot about it, but I invite you to read that paragraph, with Christianity in mind. Some of what we read in the Bible are stories about behavior. Can you think of a picture book that presents one of those stories as a legend? Now let's look at the bibliography. It consists of eleven items. Seven of them are about beavers. I assume Shaw and perhaps her illustrator, Gijsbert van Frankenhuyzen, used those items for information about beavers. The other four (two books and two websites), I assume, are sources for what she provides about Ojibwe people. Let's take a look. She lists Joseph Bruchac and Michael J. Caduto's Native American Stories published in 1991 by Fulcrum. It doesn't have an Ojibwe story about beaver. Shaw also lists Michael G. Johnson and Richard Hook's Encyclopedia of Native Tribes of North America published in 2007 by Firefly Books. 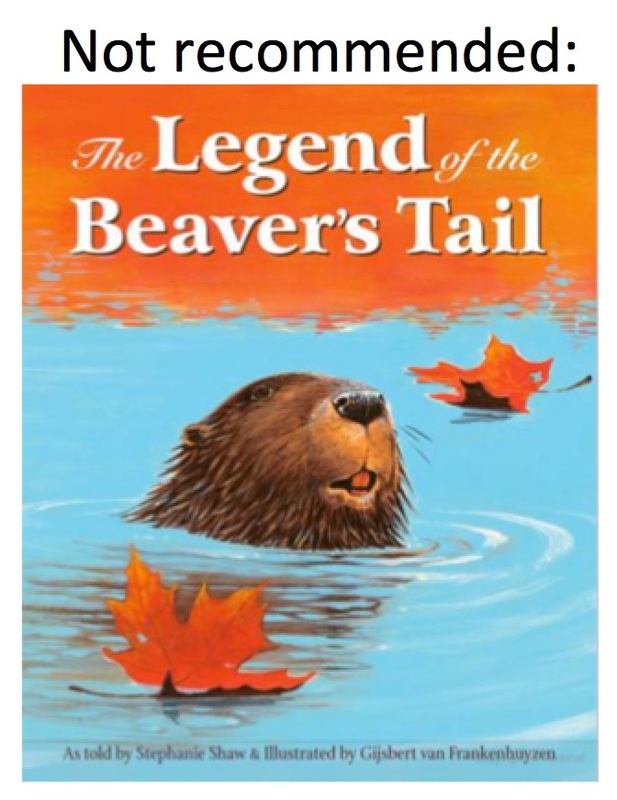 I don't know that book, but from what I can see, it doesn't have a story about beaver in it. She lists First People--the Legends. "How the Beaver Got His Tail." Accessed December 11, 2012, at www.firstpeople.us/FP-Html-Legends/HowTheBeaverGotHisTail-Ojibwa.html. I've been to that site before--and cringed. You're invited to "Click on my little kachina friends" to see what has recently been added to the site. Yikes! 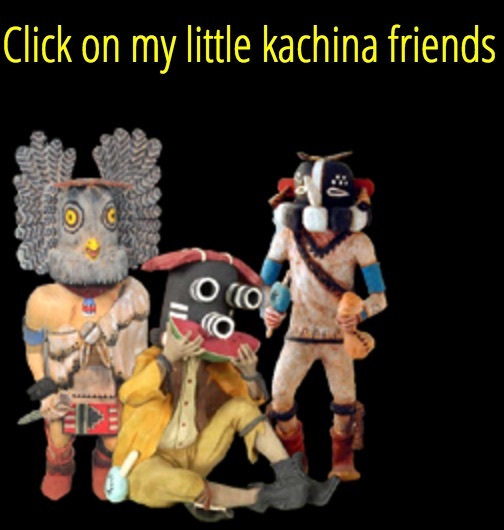 "Little kachina friends" is way over the line. Think of it like this: "Click on my little Catholic saint friends below..." instead. Feel uneasy? That's how I feel as I read "my little kachina friends." I wonder who wrote "my little kachina friends"? We don't know who owns, manages, or writes the content of that "First People" site. They use the word "we" a lot but who is "we" anyway?! They've got a section called "our favorite artists that paint Native Americans" --- but the ones they list aren't Native artists. Unless you're doing a study of appropriation, I think this site is one to stay away from. She also lists Native Languages of the Americas, a site maintained by Orrin Lewis and Laura Redish. Though we do know who runs that site, its content is unreliable. Like the First People site, I've looked it over before and found it lacking. According to the site, Lewis is Cherokee and not as involved with the content as he once was. Redish is not Native. Maybe the bibliography isn't one that Shaw developed. Maybe that page was put together by someone at the publishing house. Either way, it is troubling to see what gets listed in a book, as information to pass along to children. 4. The background-as-source-note. Better than nothing but still close to useless, this note gives some general information on the culture from which a picture-book folktale is drawn. It's important to know about traditions, but that's a background note, not a source note. In some ways, it's worse than no note at all because it's deceptive. It looks like a source note, so we let it slide by. Some notes (variation 4A) even manage to tell the history of a tale but avoid citing the book or books from which the tale was adapted. Others (variation 4B) declare that the picture-book author heard many stories from his/her grandmother/grandfather, but beg the question of where he/she heard/read this particular story. Implication is a sneaky and highly suspicious maneuver. Source notes, once and for all, tell sources. How can we know what's been adapted without being able to track down the author/artist's source? I imagine you're wondering, "well, what about the story itself?" The answer? It doesn't matter. Shaw may have told what some think is a terrific story, but without the information to support that story, it doesn't matter. It is introducing or affirming the chaos Hearne wrote about in her article. If you care about providing young people with authentic or accurate stories about Native people, this one won't work. We're told it is an Ojibwe story but have nothing to support that claim and what we are given instead of a good source, is some highly questionable websites. 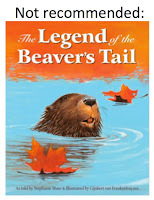 In conclusion: Stephanie Shaw's The Legend of the Beaver's Tail is not recommended. Thank you so much for all of the work that you do to help those of learning how to evaluate books continue to improve this skill. There's the picture book about baby Jesus in the manger, Good Night Manger. I think there are actually a ton of picture books around that. Let me look that up. There seems to be a ton of Bible related picture books. Yes, there are many, but are they called "legends"? Also, as a Catholic, I think a website about Catholicism or saints that had a child "Click on my little saint friends" would make the saints more accessible to the child. I wouldn't have a problem with it. For example, the Bible tells us that Moses was 'slow of speech and slow of tongue'. Midrash tells us that when Moses was a toddler in Pharaoh's palace, he used to sit on Pharaoh's lap, lift off the Royal Crown, and set it on his own head. Some of Pharaoh's advisers warned that this might mean Moses would one day try to usurp the throne and should be put to death now. Others pointed out that kids automatically reach for shiny things and it meant nothing. Pharaoh decided on a test. He presented Moses with two pans, one with jewels and one with glowing coals. If Moses reached for the jewels, it would prove that he understood their value. If he took the coals, then it would prove he was just going for the glow/shine. Moses picked up a coal and immediately raised it to his lips, severely burning his hand, lips, and tongue. And his speech was permanently affected. Among Indigenous peoples of the Great Lakes Region, Sleeping Bear Press has become infamous for publishing fakelore. Many of Sleeping Bear’s picture book titles contain the term, “legend”: The Legend of Sleeping Bear (1998), The Legend of Mackinac Island (1999), The Legend of the Loon (2000), The Legend of Lady’s Slipper (2001), The Legend of Leelanau (2003), The Legend of the Petoskey Stone (2004), The Legend of Michigan (2006), and The Legend of Minnesota (2006). Several of these titles were reviewed in A BROKEN FLUTE: THE NATIVE EXPERIENCE FOR CHILDREN. When people write, illustrate and publish picture books that explain or elaborate passages from Jewish or Christian or Muslim Scripture for the benefit of Jewish or Christian or Muslim children, they had better (1) know the material, (2) know the prohibitions, and (3) get the stories right. They do not have “creative license” to make stuff up that would misinterpret or go against Biblical or Koranic Scripture or prohibitions. If such material for children were to see publication (an unlikely occurrence), it would cause uproar. There would be, as the saying goes, hell to pay. Yet, it seems that anyone in the world of children’s writing, illustration and publishing has “creative license” to make up any old stuff and call it an “Indian legend.” And the major reviewers praise it. And it sells. And sometimes it wins prizes. As my friend and colleague, Lois Beardslee, once said to me, “it would take a roomful of people several generations to know a story.” The word “legend” on the cover of a “children’s book about Indians” reminds me of fairy tales and fables and poisonous invented cultural material, and the terms “appropriation” and “theft” immediately come to mind. Debbie, thank you again for this very, very difficult work you continue to do. Yikes! The title I was referring to was A BROKEN FLUTE: THE NATIVE EXPERIENCE IN BOOKS FOR CHILDREN. My bad.